GORDONVILLE – In the fall of 1971, a plane was hijacked in the Pacific Northwest. The suspect, who purchased the ticket under the alias Dan Cooper – misreported by news wire services as D.B. Cooper – received ransom money and parachuted from the plane into the cold and dark night. Although some of the money was recovered in 1980, Cooper was neither seen nor heard from again. His disappearance remains one of those head-scratching unsolved mysteries for amateur sleuths and conspiracy theorists (most experts believe he didn’t survive the jump). Here in the Delaware Valley, in the fall of 2013, fans of the Philadelphia Eagles have dealt with not only the disappearance, but also the mercurial reappearance of another Cooper. That would be wide receiver Riley Cooper. The same guy a lot of people wanted to run out of town after a video surfaced of him, in a possible drunken stupor, using a racial slur at a Kenny Chesney concert at the Eagles’ home, Lincoln Financial Field. But with starting wideout Jeremy Maclin down for the season with a knee injury, rookie coach Chip Kelly had a different reaction. It was to let Cooper work through the controversy, mend fences with his teammates and pick up where he left off during the final third of the 2012 season, when he clicked with then-rookie Nick Foles. Cooper began the season opposite DeSean Jackson in Kelly’s lineup and was, at one point, the far-and-away least productive starting receiver in the entire league. Cooper was doing some stellar downfield blocking, but his primary job is to catch passes. Keeping him on the field, getting starter’s snaps, was akin to playing a .200 hitter every day because he bunts well or starting a guy who averages 3.2 points per game because he sets nice picks. In the first five weeks of the season, with Michael Vick at quarterback, Cooper had eight catches for 93 yards and one touchdown. Cooper’s disappearance led for open questions about why a guy who had offended so many people – at least until Richie Incognito came along to make him look like a boy scout – was still here. In house, though, Kelly was confident that the guy who was Tim Tebow’s roommate and favorite target at Florida would step up. Cooper has not only stepped up, he has soared. The cause-and-effect behind the change is obvious, which is quarterback Nick Foles seizing the opportunity to start – after Vick was injured – and becoming one of the league’s top stories. 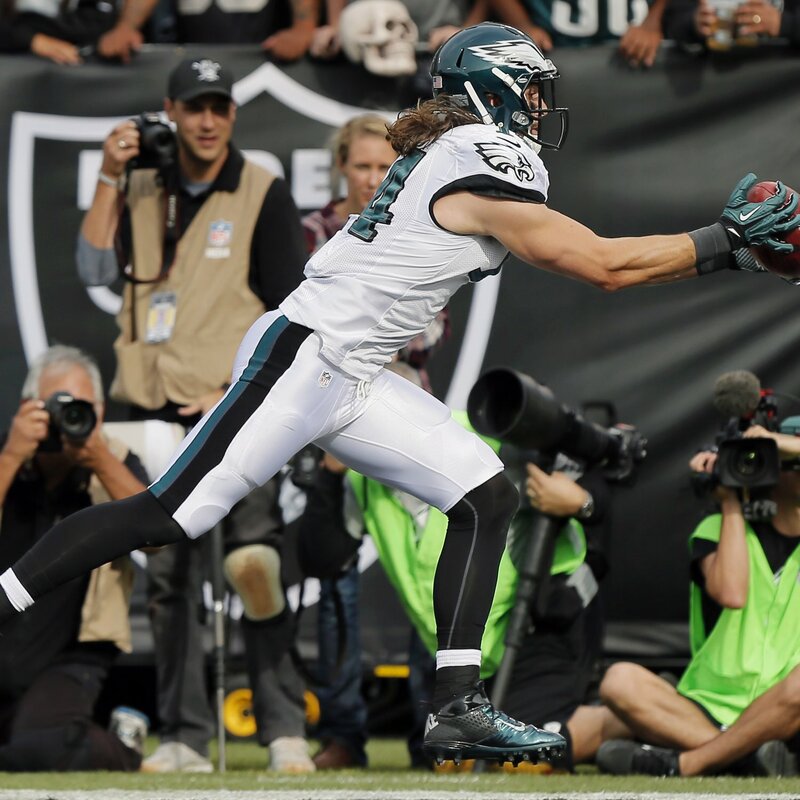 Two games ago, when Foles tied a league record with seven touchdowns in one game, three of those tosses in the 49-20 romp over the Raiders were to Cooper. Last week, in a 27-13 seminal win at Green Bay, a game most marked down as an automatic “L” when the schedule was released, Foles threw three more touchdowns. Two were to Cooper. All told, Cooper has had three 100-yard games since working with Foles. With the Foles delivering the ball, Cooper has caught 20 passes for 462 yards and six touchdowns. While projections are a tricky business, that equates to 64 catches for 1,478 yards and 19 touchdowns. It’s doubtful Cooper would post numbers that gaudy over the highs and lows of a 16-game season, but anywhere in the same zip code would be a major payoff for a fifth-round pick in 2010 who had made his bones as a special teams guy. Cooper is a free agent after this season. Presuming Foles is retained and christened the quarterback of the immediate future, retaining Cooper – as his “blanky” – would now look like a no-brainer when the opposite seemed true a few weeks ago. Cooper’s situation also sheds an interesting twist on what happens with Maclin, who is also a free agent coming off a knee injury. There is also the question of reliable slot receiver Jason Avant, who seems to have become less integral to the offense since Foles took over. Depending on how much dough the Eagles want to dump into receiving corps, which could also include recent signee Brad Smith, we could be looking at a veteran group of players who could combine to put tremendous pressure on defenses in three- and four-receiver sets. It would also take the onus away from drafting a receiver, let alone a quarterback, in the early rounds of next April’s draft. This would allow more focus on other needs, hence a win-win for the organization. But these are questions for the future. In the here and now, we are faced with mystery about Cooper’s about-face. While it is clear that Foles is the primary reason, despite Kelly’s coachspeak that “he knew it was coming” anyway, we need to explore the wherefores and whys. First, let’s remove the lowest common denominator and dispense with the elephant in the room. Vick wasn’t throwing the ball to Cooper, but it has nothing to do with Cooper’s off-field controversy. When it happened, Vick was one of the first African-American players on the team to speak out on his behalf. He is the primary reason, or one of them, that Cooper was able to come back to the team after a brief time of searching his soul and get back to work. And the NFL – past, present and future – is littered with teammates who were oil and vinegar off the field and sugar and spice on it. No quarterback on the planet is going to look elsewhere when he has an open receiver, best buddy or not, open in the end zone. It has also been theorized that it goes back to last season, when Foles and Cooper worked together on the team’s second unit, building chemistry between them. There is evidence to support this claim, as the two not only clicked down the stretch of an otherwise nightmarish 4-12 season (Cooper had 16 of his 23 catches and two of his three touchdowns during Foles’ six-game stint as a starter), but also when Foles shined in the 2012 preseason to the extent that some in Eagles Nation were quick to proclaim they had seen a glimpse of the future. The only hitch in this theory is that Cooper, after Maclin’s injury early in camp, was working with the first unit this preseason. Yes, Foles and Vick were splitting first-team snaps for a few weeks, but it was all Vick once the season began. It is not necessarily automatic that any chemistry between Foles and Cooper would magically reappear once Foles returned to the lineup in a vastly different offense from the prior season. Nonetheless, we have to say that this is part of it, if only from a confidence standpoint. Foles believes in Cooper enough to look for him, and it explodes – instead of implodes – from there. There are some other factors to consider. One is height. Foles is 6-6 and Cooper is 6-3 (Vick is 6-0). A tall quarterback able to see a tall receiver breaking open 40 yards downfield sounds simplistic, but should not be discounted off-handed. Also, there is the Jackson factor. The team’s No. 1 receiver is on pace for a career season, and it’s because he was established – early in the campaign, and early in games – by design. The inability to do so the last few years, and leave one of his greatest weapons marginalized, was one of former coach Andy Reid’s greatest transgressions. With defenses focusing on Jackson, Cooper has been able to exploit single coverage. We have to face facts, folks. Vick may be more mobile, but he is not the right quarterback for Kelly’s system because he is a square peg in a round hole when it comes to the other prerequisites. Foles is decisive, accurate, goes through his progressions and delivers the ball to the right receiver. He has a quick release, which keeps pressure on defenses already gasping for air trying to defend a high-octane attack (i.e. the Oakland game). And even though he is not Steve Young, he is not quite the statue in the pocket that his detractors make him out to be. A big-time basketball recruit out of high school, he is able to avoid pressure and make the throws. And his current interception total – zero, against 16 touchdowns – shows his ability to take care of the ball. When it needs to be thrown away, he throws it away. While it may be more perception than reality, it seems that his only incompletions have been the results of deliberate throwaways or drops. While Vick can be credited with getting Jackson going early in the season, a fact which has helped Cooper – albeit once Foles came into the picture – he was often guilty of eyeballing one receiver. That receiver was usually Jackson. If not, it was typically Avant or tight end Brent Celek. While the Foles-to-Cooper connection is making headlines, Foles has continued keeping Jackson on a Pro Bowl path and gotten other receivers – LeSean McCoy on screens, rookie tight end Zach Ertz and others – in the mix. It comes from those innate traits that all the scrambling ability on the planet can’t make up for. Another difference between Vick and Foles is the way the ball comes to a receiver. Vick threw fastballs, usually at the receiver’s numbers while facing him. Foles arcs the ball, often misinterpreted as lacking arm strength by casual observers, trying to place it over the receiver’s shoulders and into their arms while in stride. The main benefactor has been Cooper, who seems to prefer catching the ball that way. So, taken in their entirety, the mystery of his sudden emergence isn’t really that much of a head-scratcher. At least not is comparison to that of Dan “D.B.” Cooper. This entry was posted in Sports on November 15, 2013 by gordonglantz.